The start of a new year is always a time of new trends popping up and the world of weddings is not excluded, on the contrary! Among wedding planners, we are always eager to find out all the new and pretty things we will get to work with in the coming year, even if we can usually make our own predictions. A new 2016 wedding trend in floral decor was definitely expected since we already started seeing it in 2015 with the more adventurous brides. 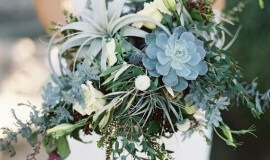 This year, we will see greenery replace colourful flowers in even more weddings than ever. Boring you say? Not at all! 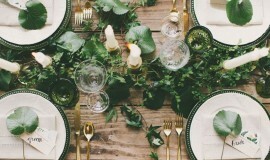 An abondance of greenery isn’t only a hot trend, it is also less pricey than flowers and lets you play with different tones and textures, not only in decor but also in your bouquet. 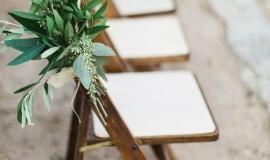 The low price tag on most green plants will also give you the chance to go crazy on quantity with gorgeous table runners or a ceremony arch that won’t go unnoticed. 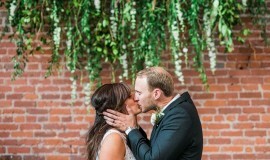 Depending on your theme or the season you’re getting married in, you can choose from a wide variety of greenery that will match your decor. 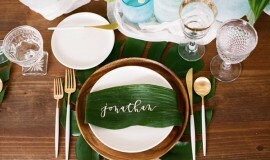 For example, banana or palm tree leaves or even succulents would be beautiful for a summer wedding with a tropical theme. 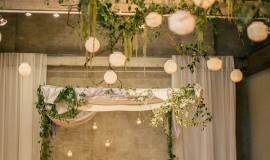 While local tree branches or fern leaves are just perfect for a more rustic theme. Tip: Don’t hesitate to discuss with your florist, who is the best person to guide you and let you know the best options for you depending on season, availability within a budget that’s right for you.